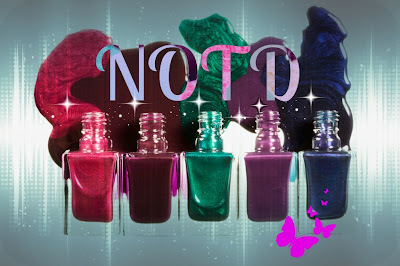 NOTD: Jindie Nails "Tastes Like Snozzberries"
Have just realised this is my first Jindie NOTD! i think this was the third bottle i got, and i just fancied wearing this one today! And yep i also realised that this is the second polish with the word "Snozzberry" in it -Dollish Polish also had one which i reviewed as a NOTD HERE. This one is totally different to the Dollish Polish one. 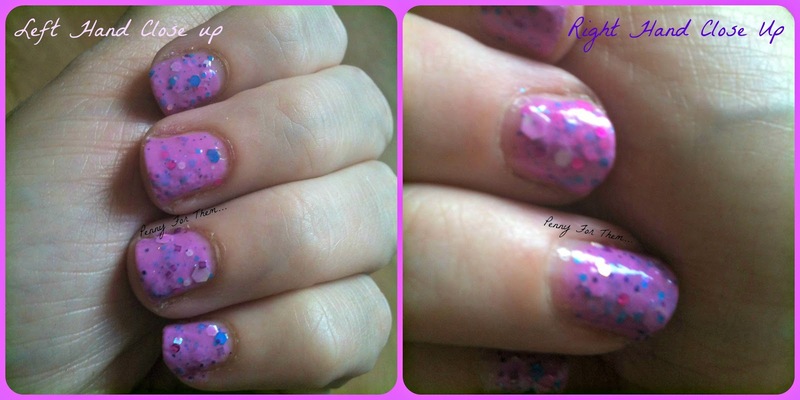 Its a pink purple polish with oodles of glitter of all colours and sizes! This is actually the first Jindie polish I've tried, despite me having a couple of other bottles! This colour is still available direct from Jindies Nails (for this particular colour, click the picture, if you wish to visit the store for all their colours click HERE) as its part of the Spring 2013 collection. "..a medium neon purple/magenta crelly base that is fully opaque, with no visible nail line showing, after 2-3 coats. Added to the bright purple base are large magenta dots, medium magenta dots, bright blue metallic hex in a few sizes & silver holographic hex in several sizes. This one also has bright blue, deep purple and magenta smaller metallic, sparkly glitters. It applies super easy with little to no fishing required to to get a ton of glitter with each dip." That's actually a really accurate description. I found the first coat quite thin and left only the slightest hint of purple, and a few pieces of glitter, but as the 2nd and 3rd coat were applied, it became completely opaque and each nail has a ton of glitter, from large hexagons to small dots. Its quite a thin polish, but what is good, is it doesn't dry super quick, so you can go over the polish already applied if you miss bits on your nail without it catching and looking untidy! the glitter is plentiful i totally agree with that! But as the coats build up and you brush over the glitter from the previous coat, it dulls the sparkle a little. BUT you can see them through the purple colour which is really unusual actually! So it has little blue and silver spots showing through, and the last coat provides the sparkle that has been covered over previously. if you look closely at it you can actually see that it has a few layers on, and its pretty cool!! Base coat i used OPI Nail Envy (as I'm trying to get my nails stronger! ), top coat was just a coat of Mavala Mavadry, which helped to dry the polish as well as giving it a gloss. For the first time i took a picture of my right hand, so you can see how different the polish looks on each nail -the glitter is different on every nail and theres just oodles of it! I love the colour of this once built up and i love the glitter and i love the fact you can see it in layers if you look closely! One thing that i would say, and I've said it before, i always seem to find something to do just after I've done my nails. I waited 10 minutes and is was dry to touch but when it caught the handle of my hoover, it scraped the polish off to the degree i could see my nail. But like i say, maybe this was because i decided the living room needed hoovering at that specific time! I didn't give it a long time to dry. Yes its my first Jindie polish to try and yep its the first one I've done as a NOTD....but something tells me this wont be the last!